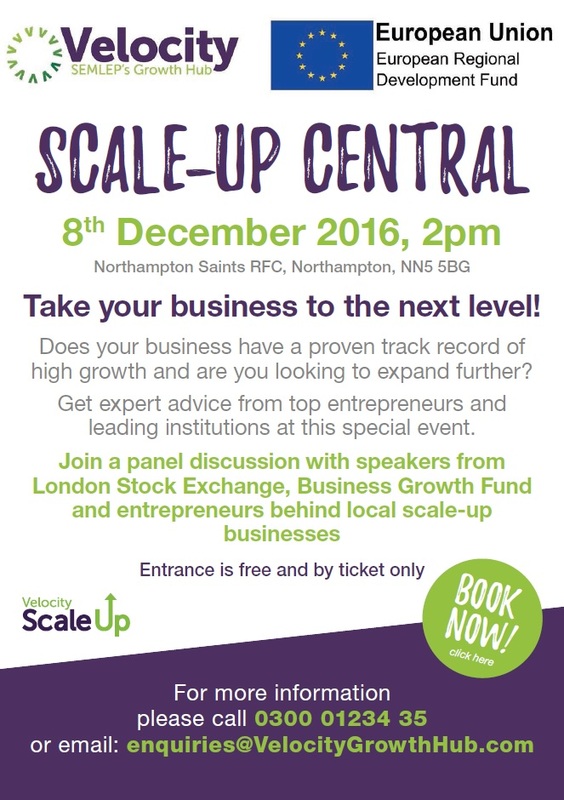 Velocity Growth Hub are hosting a free Scale Up Central Seminar on Thursday 8th December 2016, from 2pm – 4:30pm at Franklin’s Gardens (Northampton Saints Rugby Ground) Northampton, NN5 5BG. • Are you looking to take your business to the next level? • Does your business have a proven track record of high growth? • Are you looking to expand your business? If you answer yes to any of these questions, then we have no doubt that you will benefit from this event. This promises to be an interesting afternoon with a panel discussion featuring speakers from the London Stock Exchange, the Business Growth Fund, the Midlands Engine Investment Fund and local Scale Up businesses. We will also be launching our Marketplace providing the perfect opportunity to network and make new connections to make your business more productive. Admittance is free providing you have booked your ticket through Eventbrite. This event is part-funded by the European Regional Development Fund. We look forward to welcoming you to Franklin’s Gardens on the 8th December 2016.